I purchased these melts from Walmart and now that I have them home, I’m kicking myself for not purchasing more. The wax smells beyond delicious… like the sweetest bakery coconut cake I have ever smelled. YUM!!!!!! Seriously….. beyond yum!! Okay, so not the most detailed description but still pretty accurate – only they should have added butter to that. The wax smelled like the sweetest baked coconut cake with strong and delicious buttery notes…. so good, you’ll want to eat it. I used the entire clamshell pack (3 cubes each) in 2 melters in my great room. Once melting, it took minutes to start noticing the scent and after a good twenty minutes or so, my great room was saturated in mouthwatering bakery coconut. So incredibly yummy, I found myself staying in the room as much as I could just to keep breathing it in. Warm and butter coconut with sugar and flaky crust. YUM!!!! Strength – on a scale of 1 to 10, I would rate this scent a 9. It was strong and perfect. 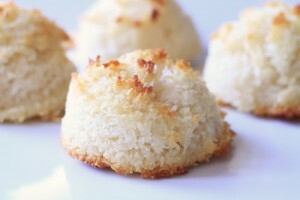 The entire upper level of my home was saturated with the sweet and buttery scent of coconut macaroons. LOVED! In closing… highly recommend this one to all you coconut lovers out there. It was awesome! 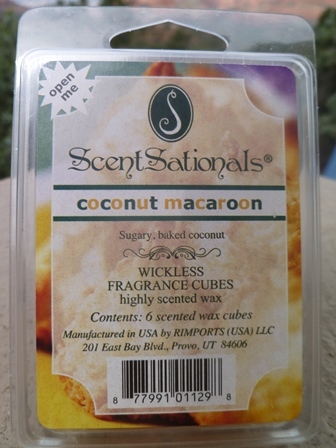 Have you tried Coconut Macaroon from ScentSationals? Review it with us. In the comment section below, review and star rate your experience… it’s easy! I love coconut fragrances - especially bakery ones and let me tell you, Coconut Macaroon from Scentsationals was amazing. Sweet and flaky coconut cookies with hints of butter. It was mouthwatering.